I own a digital SLR camera–and, although it pains me to admit this, I rarely use it anymore. That’s because my iPhone is smaller, almost always charged (and easy to recharge on the go), and almost always with me. Its size means it’s much easier to haul my iPhone with me hiking or backpacking than a full-size camera. On top of that, I can stow it easily in a pocket for quick access; the digital SLR usually takes me at least a few extra seconds to get out and ready to shoot photos, longer if I’ve stowed it in my camera bag. Those extra seconds often mean the difference between getting that great shot and missing it. Since my iPhone is almost always with me and powered up, I take far more pictures with it than I would with the full-size camera–and for a non-professional photographer like me, quantity is usually the key to getting a few great shots! Of course, it’s not always easy getting great photos and videos with an iPhone. I’ve put together this list of the best links and resources to help you take better shots with your smart phone. It may not be a digital SLR, but it may still be the best camera for you. 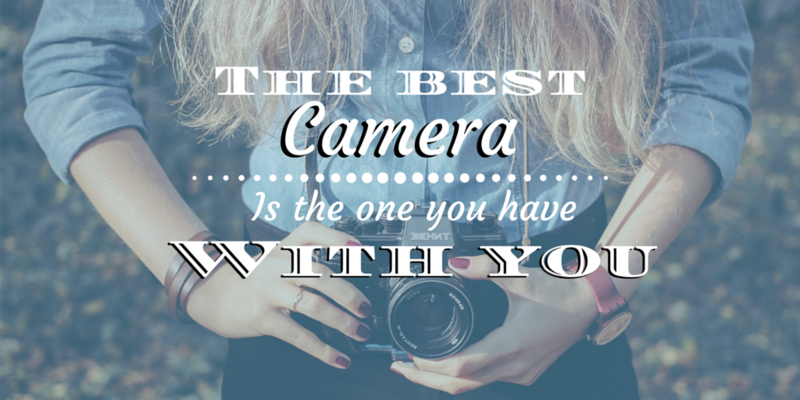 The best camera is the one you have with you! One of my go-to iPhone apps for shooting video is FiLMiC Pro. This little app offers a ton more flexibility than the native iPhone video function, including options to shoot stop-motion or slow-motion footage. This app isn’t free, but at $7.99, it won’t break the bank, either. Best of all, you’ll find a TON of great–and free!–tutorials on the FiLMiC Pro website. It’s a great resource for learning everything from basic composition principles to how to harness the full functionality of the FiLMiC Pro app. If you’re familiar with Canva, it’s probably as a (free) tool for creating graphics for social media, flyers, book covers, and so on. It provides an intuitive interface for non-graphic designers to create professional-looking graphics. I’ve also tried out the olloclip telephoto lens for iPhone . It only gives you 2x magnification, which might not be worth it for most writers. I’m happy with it, because it let me get several shots of the speedy lizards that hang out in Zion National Park that may possibly be high enough resolution to use in my current work-in-progress. I’m sure real wildlife photographers are having heart attacks at my words :), but it’s a great “intro” telephoto lens for the amateur iPhone photographer. Note that I’ve linked to the iPhone 5/5S lenses (yes, I’m still an iPhone 5 holdout!) If you have an iPhone 6, you’ll want the olloclip telephoto lens for iPhone 6/6 Plus and the olloclip 4-in-1 Lens for iPhone 6 & 6 Plus . (Disclosure: the olloclip links are Amazon affiliate links, which means purchasing through them will help support a young person’s college fund<grin>). If you’re counting, you might notice that this is #6 in the list. That’s because I have only a single link to recommend on designer Kelly Purkey’s website. Purkey’s tutorial on photo editing is so fabulous, though, that I had to add it to this list. In the linked post, she explains exactly how she edits photos on her phone using only 2 apps, VSCOcam and Snapseed…neither of which I’ve used. I guess I’ve got some homework! Have I inspired you to try some smart phone photography on your next outing? If so, you’ll want to check out this month’s free download: 3 Super Simple Tricks to Make Your Writing Portable. It’s only available to newsletter subscribers, so sign up now! You’ll get immediate access to subscriber-only resources as well as monthly updates. Continuing the theme of writing away from our desks, I wanted to bring up a tool you might not associate with writing: your camera. I don’t mean some super-expensive, high-tech device, like the Lytro ILLUM lightfield camera (drool…); I mean the camera already built into your smart phone–the one that’s probably within arm’s reach at this very moment. sparked by writing in a new location. 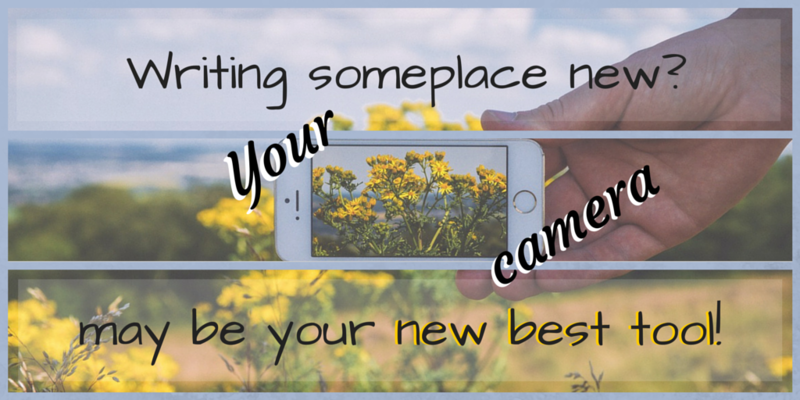 Read on to learn how your camera can help you up your writing game!